DALLAS, TX--(Marketwired - Jun 18, 2015) - Antonio Swad, restaurant veteran of over 40 years, has founded and successfully grown new brands regardless of the prevailing economic or market conditions. 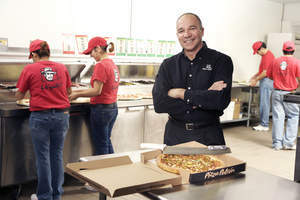 He introduced his first restaurant, Pizza Patrón, in the Pleasant Grove area of Dallas in 1986 at a time when many quick service concepts passed on the area. Eight years and four stores later, he used his earnings from the pizza business to focus on developing his newest concept, Wingstop, with the goal of making wings a center-of-the-plate item nationwide. Today, Wingstop has over 700 locations in the U.S. and internationally and recently launched a highly publicized and successful IPO. "I was thrilled to see how well the Wingstop IPO went. For me it was just one more validation that it is arguably one of the greatest restaurant concepts ever, by any measure," said Swad. "When I sold the company, it was already around 100 units open with a bunch under construction. It was a fully developed brand with great food and a silky smooth operating system -- still is. I can see many parallels between where we were with Wingstop then, and where we are with Pizza Patrón now. Both brands are unique, and both still have a ton of headroom to grow." Swad spent years working behind the counter in both concepts, not only serving as founder and chief executive, but also general contractor, fry cook and customer service specialist. Swad, 58, is the first to admit that he is very hands-on when it comes to the operation of his restaurants often popping in unannounced to check the quality of the product and service on any given day. "We have spent the last year and a half getting all of our planets aligned. Pizza Patrón has never been healthier and our team is the best I've ever worked with. We are ready to really hit the gas with respect to growth. Our best days are ahead and you will be hearing more about that very soon," said Swad. Swad wants to expand but is not desperate by any means. He says he has learned a lot about franchising over the decades and is very careful about choosing franchise partners because the restaurant business requires a professional and personal commitment that many don't understand. Swad says Pizza Patrón can easily sustain 1000+ units in U.S. and that the opportunities outside the U.S. are virtually limitless. The chain plans to announce its new franchise growth strategy in the summer of 2015.